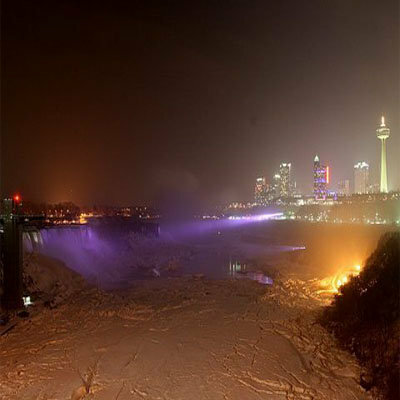 The large formation of ice created by the freezing mist that is now covering the falls has attracted worldwide attention. 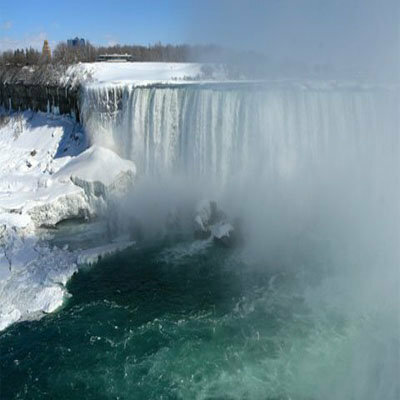 Adorned with 100-foot icicles, the winter beauty of the falls are captivating tourists and media from around the world. ABC News, the BBC,CBS,CNN and national newspapers and magazines like Time magazine, Slate, The New York Times, The Vancouver Sun, Toronto Sun and Toronto Star and the Globe and Mail and especially numerous weather channels are all talking about it. ABC’s “Good Morning America” and NBC’s, “Today” had this weekend live broadcasts from the falls. The amazing spectacle is still here for you to see and the best spot to view it is from the Canadian side of the falls in Queen Victoria Park. Stay around for the evening and see the ice and falls reflected under the nightly illumination of the falls. Here are a few photos from my files of the falls with its winter coat on.